Little girls have big dreams. They all want to be princesses, ballerinas or mermaids. Some of them want to save the world when they grow up. You can bring your little daughter one step closer to seeing her dreams come true by decorating her room in a style that illustrates her secret wishes. This is what makes princess beds for toddlers an excellent tool for the parents to persuade their toddler to sleep alone, rather than wanting to share the bed or the room with the adults. Princess beds for toddlers have to be both gorgeous and functional. They need to be appealing to little princesses, but also have the appropriate size, height and shape to comply with the safety and comfort standards demanded by the parents. This article is going to introduce you to a few of the best princess toddler beds available on the market. 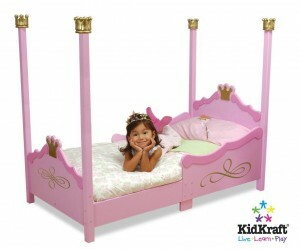 This KidKraft bed is made from wood painted in a vivid pink color with golden leaf motifs. The four bed posts and the headboard are decorated with golden crowns that would make every little girl feel like a princess. 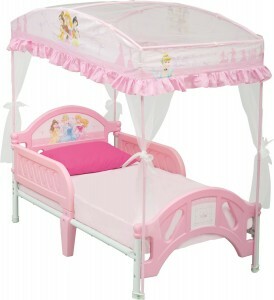 This princess bed is suitable for children 15 months and up and it can hold a maximum weight of 50 pounds. The bed has the following dimensions: 54.75 inches x 29.5 inches x 44.5 inches and it can accommodate a crib-size mattress. The mattress is not included, but you can use the one from the crib, since you’re transitioning anyway. The two side boards offer protection against falling from the bed during the sleep. The lower area enables the toddler to crawl into the bed with ease. This makes the bed safe and functional at the same time, an excellent choice for all princesses who desire a restful night sleep. 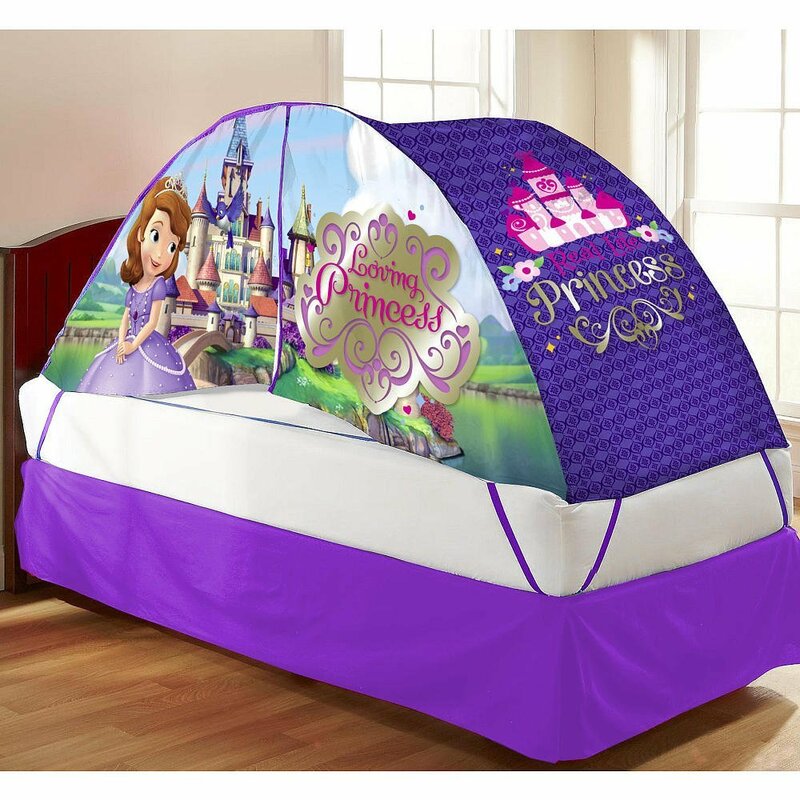 If your princess already has a bed, but it doesn’t look too fancy, you can improve it by adding the Disney Sofia the First bed tent and push-light set. 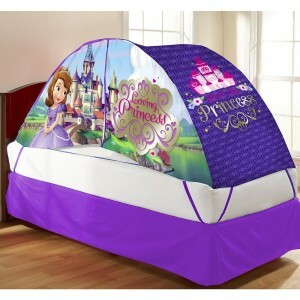 Or you can also get the 4-piece bedding set and other Princess Sofia-themed bedroom pieces for kids. The sheets and the comforter are soft and comfortable, the design is brightly colored and very appealing to toddlers and the materials are of excellent quality. The peel and stick stickers that come with the set are awesome for decorating the walls of the room in royal style. The best thing about this set is that you can take it with you on trips, so your cute little princess will sleep everywhere just like in her own bed at home. The Delta Disney Princess bed is so cute, that your toddler may want to just sit in it the whole day. The bed has a beautiful design and it is made in accordance with all JPMA standards. It can be used with a regular crib mattress, which you’ll need to purchase separately in case you don’t own one already. The bed is quite low, thus enabling easy access for the child. At the same time, it has two side rail that help protecting the toddler from falling out of the bed in case of an agitated sleep. The rails are removable, should you decide they are no longer needed at some point. 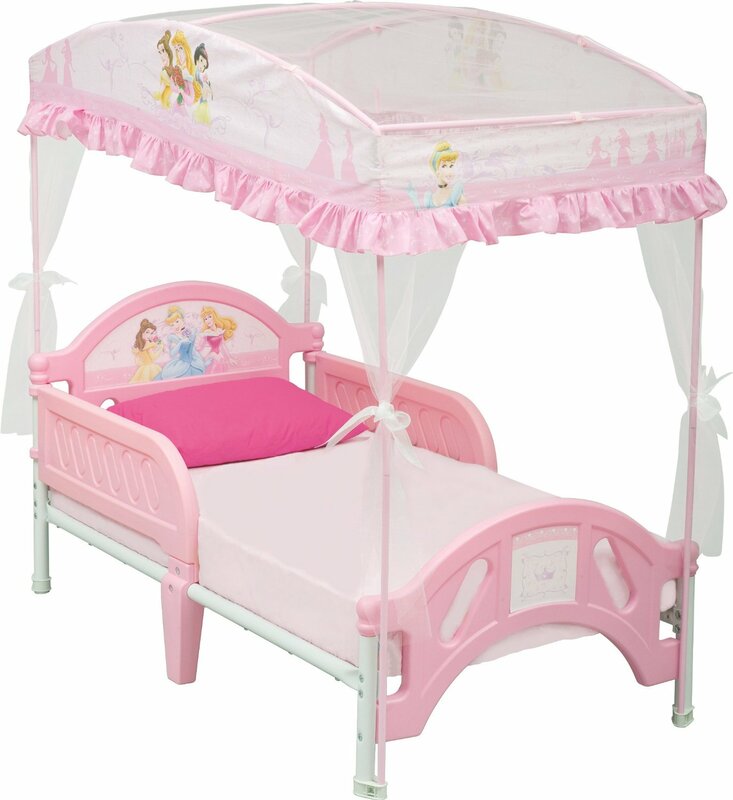 The canopy is made from sheer polyester and it is decorated with a cute, pink ribbon that any little princess would absolutely fall in love with. The Delta Disney Princess bed is easy to assembly. If you do it right, you’ll get a sturdy and reliable slumber spot for your little cutie, a safe and comfortable shelter where she can take her princess dreams one step further into the land of fantasy and miracles.